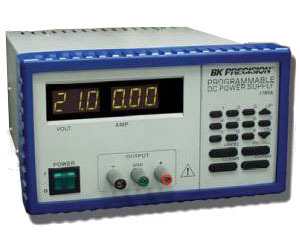 Model 1785A Programmable Power Supply offers a new level of "ease of use" and programmable functionality in a low cost solution. Direct key in entry makes voltage and current selection fast, accurate and easy. User programmed outputs allow the operator to preset 99 frequently used voltage and current settings into memory for easy recall. Preprogram a 10 step output routine via the keypad or PC interface for automated testing in preproduction, production or R&D environments. In case calibration allows for simple, cost savings, uninterrupted operation.